Zija is a delicious, all-natural beverage blended from a miracle plant called Moringa, considered by many to be the most nutrient-rich plant ever discovered. Zija is overflowing with cell-ready nutrients, antioxidants, and vital proteins. Zija is the first and only company to channel Moringa's dramatic nutritional properties into a refreshing, nourishing beverage for everyday use. * No Mixing - Just Shake and Drink! Zija is the world's foremost leader in the development, production, and distribution of Moringa products. Moringa provides a rich and rare combination of nutrients, amino acids, antioxidants, omega oils, anti-aging and anti-inflammatory properties used for nutrition. No matter what level of experience you have, Zija provides an outstanding opportunity to jump right in and build your own highly profitable business. The combination of the right product, the right timing, with the right compensation plan make Zija something truly special. 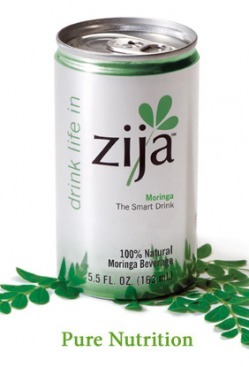 The world calls Moringa the 'Miracle Tree' and many can now call Zija their personal 'Money Tree'. At Zija, you don't need a computer or a mathematical degree to understand the financial opportunity - just five minutes worth of common sense. Our compensation plan provides eight fabulous ways to make money. Paid out when you sell Zija to other people who do not qualify for wholesale pricing. You'll either earn a $5 or $15 commission on each case of Zija you sell. Paid weekly. This commission pays out 45% on 5 levels and is earned by Active Distributors of any rank and is based on the sales volume of the first order made within 30 days by new customers or distributors. Paid weekly. This commission pays out 46% on 9 levels and is earned from the ongoing sales made by Customers and Distributors after the first FastStart purchase. The amount you are qualified to receive is based on your rank, which dictates the number of levels for which you are paid. Unilevel uses Real Compression in calculating commissions. Paid monthly. This pool is divided on a pro-rata basis amongst the top Active Distributors, based upon their personal FastStart sales volume generated during that month. The pool is funded by the FastStart commissions that were not earned by other Zija Distributors. Paid monthly. Rewards Active Distributors with bonus checks for meeting specific rank qualifications within set periods of time. It's paid in the 4th, 6th, 9th, 13th, and 19th months after enrollment to qualified Directors, Senior Directors, and Executive Directors. Three pools of money are funded with up to 4% of Zija's gross product sales. Its paid out on a pro-rata basis to qualified Executive Directors (ED). Paid quarterly. Each week we reward qualified Executive Directors with either 1%, 2%, or 3% of the FastStart sales that have been generated in unlimited legs and levels within each Executive Director's organization. Paid weekly. Each week we reward qualified Executive Directors with either 1%, 2%, or 3% of the UniLevel sales that have been generated in unlimited legs and levels within each Executive Director's organization. Paid monthly. Autoship is all about convenience and no-hassle savings. All you do is sign up to automatically receive your monthly purchase of Zija, and you'll save time, money, and worry. You'll never have to remember to call in your order, so you'll never miss your earned commission.